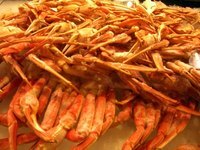 King crab legs can be cooked in a variety of ways and their sweet, tender meat is generally paired with melted butter. When crabs are caught, they are generally cooked on board the fishing vessel and flash frozen to preserve flavor. However, in time crab legs can go bad; if that happens they must be discarded. Check the date. Generally, king crab legs have an unfrozen shelf life of five to seven days. If they have been sitting in your refrigerator for longer than this, it is likely that the meat has gone bad. When frozen, crab legs can last as long as 12 months and still retain flavor. To ensure you are not eating expired crab legs, date your meat so you know when it was purchased. Look at the color of the meat. Unlike the body of a crab which has brown-colored meat, crab leg meat should be snow white. When you crack open a crab leg, check the color inside. If the color seems off, avoid eating the meat as it could be bad or overcooked. Poke the exposed crab meat with a fork to check the texture. King crab meat should be very delicate, not tough and chewy. If the meat is tough, you have overcooked the crab and the meat has gone bad as a result. Since most crab legs have been pre-cooked, they require little cooking time – only a few minutes. Perform a taste test. Crab legs should have a sweet taste. If the taste seems off, avoid eating the meat since it may have expired.